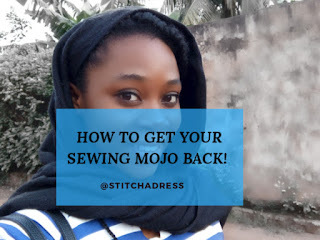 STITCH-A-DRESS: HOW TO GET YOUR SEWING MOJO BACK! and its something sometimes we can't help so what do you you do when you lose your sewing mojo? How do you get back that excitement and love you have for sewing? First of all you when you notice you have lost interest in sewing just take your time to enjoy quality time with yourself, friends and family it might be weeks or even a month sef but do this to refresh your mind and loosen every tight muscle in your body. Next up is to identify what made you lose interest in sewing...it might be due to a failed style (major reason when i lose interest), not learning as fast as you imagined and you feel stuck, lack of fabrics, loss of a loved one or something more personal. I have experienced this time after time and these tips have helped out and like the sweetheart i am i'm willing to share! So here... *drum rolls* they are! A dose of Instagram: instagram as we all know is a photo App that houses lots of beautiful styles and its the number one to-go app for style inspiration so if you are in this situation just open the IG app on your phone and search for #ankarastyle or #skirtstyle by the time you are done surfing you would have seen one or two styles you want to sew or tweak here and there to create something and just like that you are thinking of sewing again. Buy fabrics: its no news that every time a seamstress visits a fabric shop she automatically has a style in her head for the fabric before even buying. In this case just visit the fabric shop to buy one fabric and trust me by the time you are out of the shop all you would think of is sewing! sewing!! sewing!!! and you might even end up buying more than one fabric. Talk to a seamstress: the best people to talk to when you are going through stuffs are people in same line of profession or people that have experienced it before because they have been there so they know how it feels and the best advice to give. My closest friends are seamstresses and i remember when i started losing interest in sewing one of them encouraged me and now am sewing better, blogging, running an easywear line and aiming for greater things. One thing sewing has thought is to hang in there whether what am doing is looking like a flop till i get the final result. I hope this helps you get your sewing mojo back and if it doesn't feel free to send me a direct message on facebook or Instagram. Have been there before lets hear how you snapped back!